This is where you get the information to buy stuff! PLEASE FOLLOW THE LINKS TO DETERMINE WHETHER OR NOT THIS STUFF IS IN STOCK FROM THE FOLKS WHO SELL IT. IT LIKELY ISN'T! SORRY! Please note that all of the addresses given are of reliable people who will not rip you off. My friends Dan Yemin, Jeff Ziga, Mike McKee, and I play(ed) in this band. 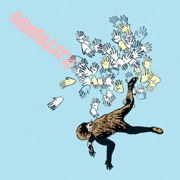 This is the 11 song recording of Armalite. We like it. Click here for song listing. 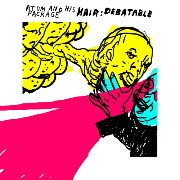 Hair : Debatable CD w/ bonus DVD Released April 6th 2004! 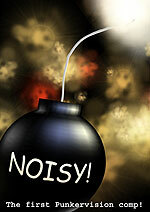 This is the BRAND NEW 25 song recording of the FINAL Atom and His Package performance. This release comes with a bonus DVD that includes the final show in its entirety, documentaries and a video. Click here for song listing. Van Nuys, CA 91409-7495 U.S.A. 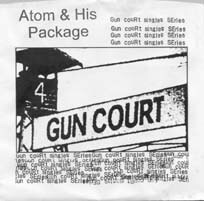 This is the newest 12 song Atom and His Package full length record. Click here for song listing. 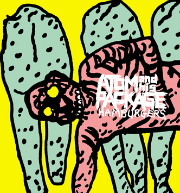 Hamburgers CD Released June 2002! This is the NEW-ish 5 song Atom and His Package record including the songs 'I Am Downright Amazed (at What I Can Destroy With Just a Hammer)', 'Fraudulent' and more. Click here for song listing. On Hopeless Records. 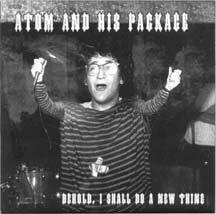 This is the 4th Atom and His Package full length record. Click here for song listing. On No Idea Records! 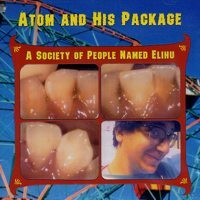 This 17 song collection compiles the 3 Atom and His Package EPs, compilation tracks, and other junk. Click here for song listing. 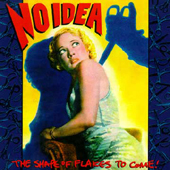 On No Idea Records! 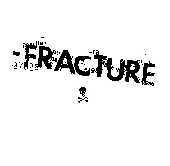 This is a 20 song CD discography of my old band Fracture. The song on the end of the Society of People Named Elihu CD/LP "No Way DNA" is a Fracture song. So are the other songs on this CD (hee hee). This is a 20 song CD that includes songs about black metal, a punk rock high school, and a very obese goaltender who excels in hockey because of his size and more!! Comes with big booklet and bonus Fracture song on it.Click here for song listing. I DON'T KNOW IF THESE ARE IN STOCK ANYMORE, BUT YOU'RE WELCOME TO INQUIRE! The LP version of A Society of People Named Elihu was released in March 1999 by the German label X-Mist Records. It is bigger than the CD, but still only contains 20 songs. The First CD Released March 1997 This is also a 20 song CD that features a song about getting rid of people who annoy me, with a gigantic crane, a love song about a boy in love with a girl who is just a head, a song about trick or treating with the Geto Boys and more! 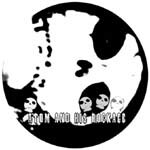 Features brutal, brutal covers of Brutal Truth and Born Again$t songs. Click here for song listing. Scott Beibin (Bloodlink Records guy)finally got around to making the packaging of the CD look presentable. I DON'T KNOW IF THESE EXIST/ARE IN STOCK ANYMORE, BUT YOU'RE WELCOME TO INQUIRE! 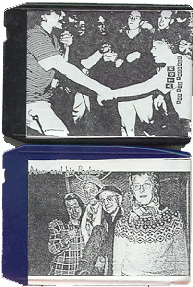 This is a compilation DVD of parts of live sets from 10 different punk bands, including Atom and His Package, Propagandhi, Good Clean Fun, Supersuckers and more. Over 90 minutes. 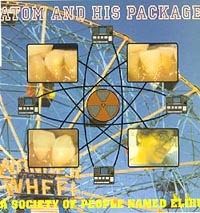 The footage of Atom and His Package is from a show in Cardiff, Wales from 2001 and is notable because I ended up not being able to play most of my set because a gigantic, drunk Welsh skinhead kept interrupting the show by yelling at, and eventually tackling me, though sadly the actual tackling of me is not on the DVD. Van Nuys, CA 91409 USA. A portion of the proceeds for this record will be donated to the Philadelphia Direct Action Group. 7" record with me and and a few friends doing "rock" versions (with real instruments) of some of the older Atom and His Package songs. 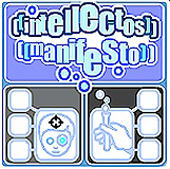 Includes versions of Avenger, He Kissed Me, Atom and His Package, and Head (She's Just A). Only 208 of these were pressed. These are out of print. an old favorite band's (The Dead Milkmen) song "Nutrition". funny straight edge band I Hate You's "Bloody Lip" and two more. The 7" is now OUT OF PRINT (DO NOT ORDER!). Atom and His Package does a cover song called Radon by the band... Radon! It's available on CD for $1 or free with any order from No Idea Records and Distribution! It's available on CD for $4! 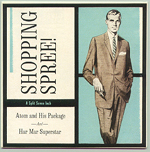 Click here for an MP3 sample of the previously unreleased Atom and his Package song. 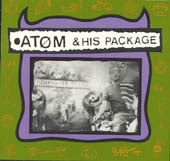 Atom and His Package does a cover of the Velvet Underground song "Stephanie Says" on this. It's available on CD for $9(US) or $11(to everywhere else in the world). 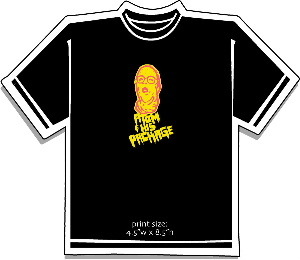 Shirts, Posters, Buttons, Patches, Keychains & Stickers! 11 Color, 9" x 24" (I know, I know... it's not in the metric system, that's big!!!) 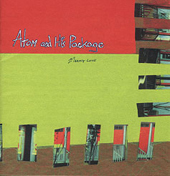 hand screened Atom and His Package posters. These were made by my friend Andrew Jeffrey Wright. Limited run of 130. Support independent artists! THESE ARE NOW SOLD OUT! 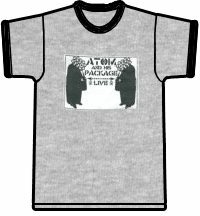 NEW 'Atom Melted Head' t-shirts designed by "The Steak Dept". Want one? SORRY, THEY'RE SOLD OUT. THEY EXISTED AT ONE POINT THOUGH! T-shirts designed by "The Amputees" (Combat Wounded Veteran/ex-Reversal of Man designer). Want one? SORRY, THEY'RE SOLD OUT. THEY EXISTED AT ONE POINT THOUGH! New t-shirts designed by "The Amputees" (Combat Wounded Veteran/ex-Reversal of Man designer). Want one? SORRY, THEY'RE SOLD OUT. THEY EXISTED AT ONE POINT THOUGH! 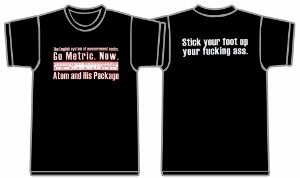 Pro- metric shirts. Want one? I AM NOT RESPONSIBLE FOR YOUR FOLKS GETTING MAD AT YOU! Grey Atom and His Package 'ringer shirts'. SORRY, THEY'RE SOLD OUT. THEY EXISTED AT ONE POINT THOUGH! Atom and His Package 'Rock a by baby' shirt. 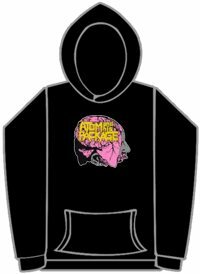 New Atom and his Package 'hoodies'. Still want one? "My Child is an Honor Student at the Punk Rock Academy" bumper stickers. 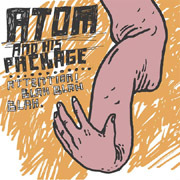 "Atom and His Package 'Attention! Blah Blah Blah'" button. Want one? 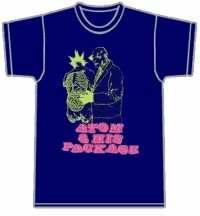 "Atom and His Package 'That's A Mouthful'" button. Want one? "Atom and His Package" keychain. Want one? 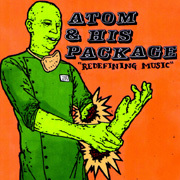 "Atom and His Package" patch. Want one? Go Back to Main Page?